Sacred music has long been a source of inspiration and creativity for the jazz musician. 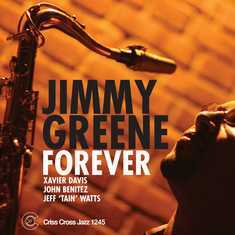 Forever, Jimmy Greene's second release as a leader for Criss Cross, finds the tenor saxophonist continuing this rich tradition. Backed by the hard swinging rhythm section of Xavier Davis on piano, John Benitez on bass, and Jeff 'Tain' Watts on drums, Greene combines modern arrangements of traditional spirituals with originals inspired by sacred themes. Greene's talents as an arranger and bandleader are in full view, as he gives classic spirituals a fresh, contemporary treatment. This is a powerful session from beginning to end.